My best friend has always a lot of kids over at her home. She has one of her own and she is babysitting for a living. This makes that her house is never completely tidy. But who cares? The kids should be able to play, don’t they? 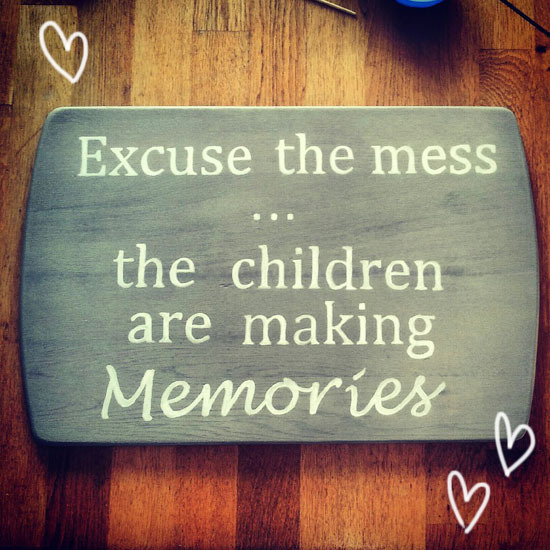 So when she saw the quote ‘Excuse the mess, the children are making memories’ she decided it had to be on her wall. Of course I had my ideas on how to make the sign. We went to the thrift store and purchased the tabletop of a small table. Perfect for this project because it already had the desired shape! You can make a sign like this for just a few dollars, or with things you already have lying around in your home! See how I made this inspirational quote sign after the jump. . .
Do you want a video explanation of this technique? I now teach a course on Skillshare where you can learn how to make this sign! 1. Choose a font and the text on your computer. Print it out in the desired size. 2. Cut the words out and put them on your piece of wood. If the size of the text is right you can move on to the next step. If not, you have to repeat step one. 3. Draw with chalk on the back of the paper. Tape the paper down on the wood with masking tape, chalk side down. Trace the letters with a pencil. 4. Remove the paper and reveal the letters on the wood. Chalk is really easy to remove so it’s best to work line by line. Just trace the first words, paint them and repeat for the next words. Otherwise your letters are long gone before you get to paint them. The fact that it’s easy to remove can also be a good thing: it doesn’t take much work to clean the lines up when you’re done! 5. Now it’s time to paint the letters. I used acrylic paint and a small paintbrush. When the paint is dry you can repeat the process until your sign is completely done. 6. You’re sign is ready for display!